It’s a good idea to share a family meal with such relatives, but don’t try to understand them. If there are two things you can count on at this time of year, it is that 1) you will get irritated by (and perhaps even shout at) a relative; and 2) you will read articles about why that makes you a bad person. This is the time of year when we see self-help guides on how to have a peaceful and joyous holiday by learning to get along with difficult family members. Dealing with annoying relatives is a common problem, but it is especially rough in the Trump era, when even the bluest family is bound to have at least one Trumpster in the mix. So, in contrast to all of those feel-good pieces that give you advice on how to create a joyful connection to your family’s own Trump fan, I’m suggesting the opposite. Don’t bother trying to understand or empathize with someone backing Trump. There’s scientific evidence that it’s not merely a waste of time; it might actually cause you psychic harm. While it may have been possible to try to process how someone voted for Donald Trump in the first place, anyone who still supports him is a lost cause. There are not “many sides” to the story, as Trump himself claimed in the wake of the Charlottesville attacks. There is no moral equivalency between neo-Nazis and Antifa protesters. There is nothing cool about a president who bullies on Twitter. There is no justifiable argument for the Muslim ban or for a proposed tax bill that only helps the billionaire class. No, “clean” coal is not an ideal energy source. There are no alternative facts either. And trying to talk to folks who think any of that makes sense is a terrible idea. This holiday season we have the normal, everyday challenges faced by families with a range of political views, plus the hyperbolic situation created by Trump. In July, the Washington Post ran a piece by Aaron Blake that fretted over the fact that “nearly half of liberals don’t even like to be around Trump supporters.” Blake cites a Pew Research study that showed that “Democrats are actually substantially less able to countenance friends who supported the wrong candidate.” Then, he goes on to express surprise over another study that showed that 47 percent of Clinton supporters didn’t even have a close friend who planned to vote for Trump. He then also points out that Pew found that 68 percent of Democrats and Democratic-leaning voters find it “stressful and frustrating” to talk to people who have a different opinion of Trump. He further notes that those on the right reported being more open to hearing from those on the left than vice versa. There is lots to unpack here, but let’s just emphasize a few key points. First, it makes perfect sense that a liberal might find talking to a Trump supporter “stressful and frustrating,” particularly given the ceaseless racist, xenophobic, sexist, narcissistic drivel that spews from his mouth. Trump is a disaster in every sense of the word; anyone who defends him is going to stress you out. And, of course, few Clinton supporters had close friends who were Trump supporters. How exactly are we supposed to be close to someone who supports him? And the last point, that Trump supporters were less bothered by Clinton supporters, seems completely false and likely tainted by the self-reporting of the poll. This is the group of dogmatic people who supported a guy who chanted “lock her up” and who loyally watch only one news network: Fox News. Anyone making the case that Trump supporters are more open and flexible to opposing views simply isn’t paying attention. Trump has gone from bad to worse, taking anyone still on his side with him. There is no room to get along or reach across the aisle when the issues at stake are whether or not Nazi protests on college campuses are OK. As Jimmy Kimmel put it succinctly after the Charlottesville attack, “If you’re with a group of people and they’re chanting things like ‘Jews will not replace us’ and you don’t immediately leave that group, you are not a very fine person.” If those same people are eating holiday meals with you, feel free to leave the room as well. Activist group Showing Up for Racial Justice even created a Thanksgiving Discussion Guide last year that actually encouraged people to bring up the issue of race with Trump-supporting family members: “Sometimes the first place to start is at home, with the people we are closest to.” It then offered a hotline in case the conversation went awry. Following the presidential election, there were tons of articles that claimed that what we needed to do was talk to one another “in order to heal,” as one piece in the Washington Post put it. Note that the right hasn’t embraced this dialogue of “healing” and starting conversations” with those with opposing views. Have you ever wondered why there aren’t pieces in Breitbart, Fox News or InfoWars about how Trumpsters need to embrace their family lefty? There aren’t any because they don’t care. And they have no interest whatsoever in healing anything. This all leads me to wonder whether one of the biggest problems the left might have today is that we spend more time trying to understand a racist, sexist, xenophobic bigot and the people who like him than we spend actually fighting for progressive politics. The mere idea that the problem here is that we aren’t reaching out and hugging Trump supporters suggests that the problem is something we can control. It implies that if we were only more understanding, more compassionate, better listeners, we could make this right. And it is a notion that is completely idiotic. Let’s be clear. Anyone who still supports Trump isn’t in the same moral universe. And any time you spend trying to connect with that person is only going to mess you up and waste your time. All of these pieces say the key is listening — not agreeing with — but giving the person with the opposing view a chance to express themselves. That’s a fine plan if what we disagree on is whether or not we should have a path to citizenship for undocumented immigrants. But it’s completely insane if what we disagree on is whether or not Mexicans are rapists. If we want to debate the merits of a tax cut for corporations, that’s fine. But if we want to debate whether Roy Moore should be running for office, that’s nuts. The point is that productive debate over political issues requires at least a modicum of a shared reality. And the modern Trump supporter simply doesn’t live on the same conceptual planet you do. To make it worse, the idea that any productive conversation can happen over a dinner table contradicts all research on changing political views. Most research shows that those with fiercely held political beliefs almost never change their views, but, if they do, it isn’t happening over dinner with a relative. Researchers Brendan Nyhan and Jason Reifler have uncovered these issues in several studies. One recent one suggests that one of the best ways to get someone to adjust a political view is with graphs, not texts — and certainly not with conversation over apple pie. Moreover, research shows that when someone’s political views are questioned they often feel as though their entire identity is under assault. That’s a recipe for a family meltdown. But there’s more. Today’s Trump supporter is so totally divorced from reality that having any sort of conversation with them where you attempt to see their point of view may actually damage your own brain. Trump is a serial liar and those who support him spout those same lies. Research shows that engaging with lies has two major negative cognitive effects on those of us who like the truth. First, to listen to a lie and then try to debunk it, the brain has to accept the lie as true, only to then refute it. Over time that process takes a real toll and risks exhausting your cognitive abilities. It’s what we call “brain fry,” and many of us suffer from it. The second problem is repetition — or mere exposure effect. When a brain encounters a lie repeated endlessly, it becomes a lot harder to forget it and may even start to feel true. This is why Trump supporters think he was a good businessman: because he said so endlessly. (Note: It’s not true.) Even worse, the more you hear the lie, the quicker your brain processes it. Over time it may actually get to you. This gets us to the core of the issue: the oft-repeated argument that the real problem facing this nation is that we live in so-called echo chambers. 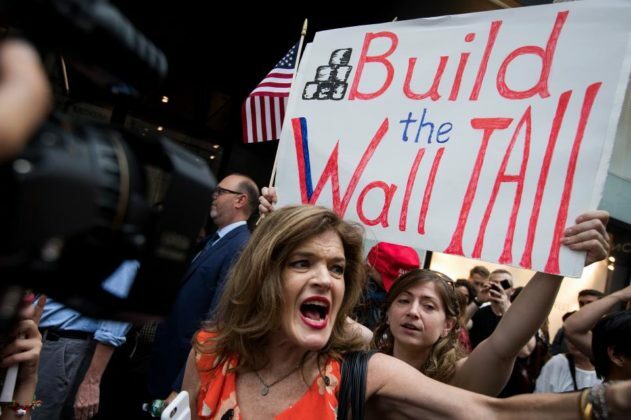 A recent piece by a psychologist in Huffington Post worried that “political polarization is a psychology problem.” Noting that 88 percent of Republicans like Trump and only 8 percent of Democrats do, the article stressed that we are in an era of extreme political divisiveness. The problem with these divisions, according to the article, is that they create group polarization where people are in “danger of living in silos” that reinforce their views. It’s amazing to note the traction that this line of thinking has gotten in public discourse. All of the fretting over silos and echo chambers is yet another sign of how the left can miss the point. Here’s the deal: Not all silos are created equal. And it makes perfect sense to live in a community of like-minded individuals. If their silo likes Nazis and thinks pedophiles are OK and my silo likes facts and science, then I say let’s keep our silos as far apart as possible. The phrase “echo chamber” suggests everyone in the group just mirrors everyone else. And that is exactly what does seem to happen in a lot of right-wing groups. Surely on the left we have echo chambers too. But what if my so-called echo chamber is filled with people who like a healthy, well-reasoned debate and enjoy critical thinking? What if my echo chamber includes Neil deGrasse Tyson, Samantha Bee and Amy Goodman and theirs has Rick Perry, Alex Jones, and Steve Bannon? The idea that the problem is the echo chamber is incredibly dumb. It’s what is resonating in the echo chamber that is the problem. So, my holiday advice is to stop reading those ridiculous self-help columns and avoid attempting rational or political conversation with your Trump-supporting relative. Forget it. Give up on it. Talk about how yummy the pie is and whether it will snow tomorrow and move on. Or, if you have a family member who can’t resist the urge after a few glasses of wine to get into it with you, do the dishes or just go to bed. Do everything you can to escape the experience with as much of your sanity and self-worth and fighting spirit as you can. Sophia A. McClennen is professor of international affairs and comparative literature at Pennsylvania State University. Her latest book, co-authored with Remy M. Maisel, is, Is Satire Saving Our Nation? Mockery and American Politics. Follow her on Twitter at @mcclennen65.